Not only are there four other candidates running for the position, but the district is huge — covering eight complete counties and a portion of a ninth county. “By the time the campaign is over, I will know the district, the issues and the people,” Sullivan told a crowd of about 60 supporters at the Cedar Rapids Community Center Sunday. She is now introducing herself to county boards and other public bodies throughout the district, and plans to be on the road campaigning full time by early March. She and her husband, Mike, have lived in Cedar Rapids for 25 years, where he is president of Cedar Rapids State Bank and she serves on the bank’s board of directors. They have two grown daughters and one grandson. Already involved in local economic development efforts, Sullivan said she will work with business leaders to bring more jobs and opportunities to the 41st District. She served on her local school board for 12 years, and said education is one of her priorities. 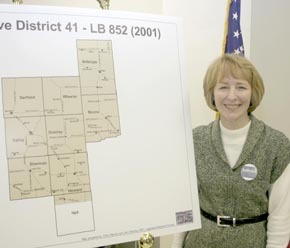 Discussing the makeup of the Legislature, Mrs. Sullivan noted that rural senators are outnumbered by urban senators. This will require her to use her skills in developing relationships and reaching compromises while keeping the priorities of her district in mind. These qualities will help make her an effective state senator for central Nebraska, she said. Speaking in support of Sullivan’s candidacy were District 34 State Senator Annette Dubas of Fullerton and Boone County Commissioner Tom Schuele of Cedar Rapids. All best wishes to Kate. With any luck, she’ll get in touch with me. btw: I hope she received the CD.